DEVIL eggs or ANGEL eggs? We had deviled eggs for our cookout on July 4th. I guessing a lot of holiday cookouts included the dish. My recipe comes from my mother. She never wrote it out, but I watched her enough to know you mix the egg yolks, mustard, mayonnaise, and sweet relish until the stuffing will fill the hollowed out egg whites. Sometimes I spice the mixture with dill relish instead of the sweet. Mother would be appalled so don’t tell. I served our deviled eggs on the plate that belonged to my husband’s sister. It’s a way to include those who have gone before in our celebrations. We always have my aunt’s baked beans, my mother-in-law’s chocolate cake (the one with the secret coffee ingredient that we never told my father-in-law about–he didn’t like coffee, you see.) and, of course, daddy’s homemade ice cream for family cookouts. The tradition makes us feel like they’re all with us in spirit. As we sat around waiting on fireworks, we talked about how deviled eggs came to be called deviled. Surrounded by techno-device-loaded friends and family, the race for the answer commenced. Fingers moved on iPhones, iPads, and Androids. Soon Google came to the rescue, revealing interesting things about deviled eggs. 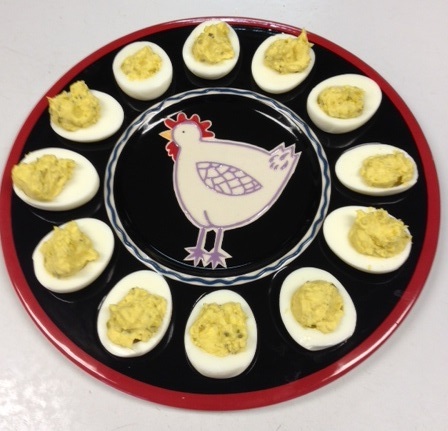 Deviled eggs have been around since the first century and ancient Rome. The recipe was first compiled sometime between the fourth and fifth century A.D.
By the 15th century, stuffed eggs had made their way across much of Europe. By 1800, deviling became a verb to describe the process of making food spicy. The popular egg hors d’oeuvres are also called “mimosa eggs,” “stuffed eggs,” “dressed eggs” or “salad eggs”—especially when served at church functions. Why, you wonder…in order to avoid an association with Satan, of course. We also learned that, though most standard recipes include mayonnaise, the condiment didn’t appear in published deviled egg recipes until the 1940s. That fact led to a discussion of recipes, which included pickles, dill, bacon, crabmeat, sriracha, kimchi, wasabi, and caviar among other ingredients. Some of which I am so glad were not in my family recipes! So how do you make your deviled eggs? More importantly, do you call them angel eggs? ← It’s America’s Happy Birthday! Thanks Judy, interesting read. I have never heard of Angle eggs In one recipe I have tried I added grated cheese. We enjoyed that here. I seldom devil eggs. All eggs too fresh. I have an acquaintance who lived in IL with young and her parents had 10,000 chickens!! Her mom BOUGHT eggs when she deviled eggs. Now, must get outside and do chores before it gets too hot.